Join us for the second and probably the last #MarchesHour at the café in 2016, at Rocket Kitchen Café, Church Street Hereford. There will be 10-minute talk on how to drive more traffic to your business by using your blog more effectively. Can your organisation take advantage of the current Pokémon Go craze? We will have a quick look at the marketing opportunity this popular game could have for your business/organisation. In the community announcement section, you take the floor! You have the opportunity to announce your business, organisation, product or services to everyone present. #MarchesHour at Rocket Café is FREE. To reserve a place please click here. What exactly is #MarchesHour at a Café? #MarchesHour at the Café is a free, informal networking for small businesses, organisations, charities and individuals in and around Hereford. It offers followers of #MarchesHour the opportunity to extend their interaction beyond the limiting 140 characters allowed by Twitter, to a more personal face-to- face interaction. You can use #MarchesHour at the café as a platform for a new product launch or to announce a community event. 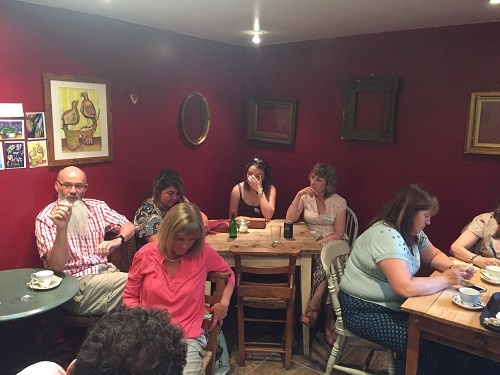 You can also get to know the faces behind Herefordshire twitter accounts you follow or those that follow you at a #MarchesHour @ the café event. The topic for the second #Marcheshour at the café is marketing. We will be looking at unusual and innovative ways to market your product or services and how to take advantage of new, innovative marketing approaches that help you to stand out from the crowd.